An exciting development for A. Lange & Sohne will be displayed for the first time at the upcoming SIHH 2010 industry exhibition, the Lange 1 Daymatic. As the first self-winding movement to appear in the line, it will surely be drawing some attention to itself at the event. The Daymatic has the easily recognizable Lange 1 look with one very big exception - the classic Lange 1 displays have been reversed. The manual Lange 1 watches have the off-centered time display on the left side of the dial and the date on the right hemisphere respectively, the Lange 1 Daymatic switches things in reverse. The delivery of this watch is estimated to be sometime in mid 2010. 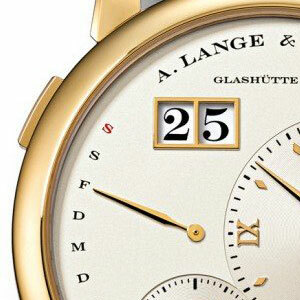 The case of the Case A. Lange & Sohne Lange 1 Daymatic watch measures 39.5 millimeters by 10.4 millimeters and will be available in Yellow gold, Pink gold, Platinum. 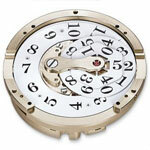 Each dial will be produced in solid silver with the variations being champagne, argenté and rhodié. The hands will compliment the chosen case and will be constructed of Yellow gold, Pink gold or Rhodiumed gold. The dial and case-back are protected by sapphire crystal with a hardness rating of 9. 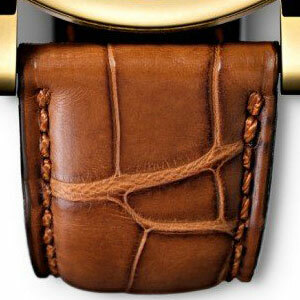 Each watch will be completed by a hand-stitched crocodile strap and a Lange prong buckle in solid gold or platinum. The Daymatic is powered the caliber L021 self-winding movement which measures 31.6 millimeters in diameter and 6.1 millimeters high. The movement has been crafted to the most exacting Lange quality standards and decorated and assembled by hand. The movement is made up of 426 individual parts which includes 67 jewels and 7 screwed in gold chaton. The movement allows for a power reserve of 50 hours when fully wound. The functions include: hours and minutes, subsidiary seconds with stop seconds, patented outsize date, retrograde day-of-week display. References 320.021 320.032 320.025. This watch is estimated to be in the $50,000 and up range. The new Zeitwerk watch from A. Lange & Sohne is a beautiful combination of the brands traditional style and technical accomplishment that the brand is known for and a new and interesting take on time display. The extremely high quality mechanical watch is unique for the brand, straying from the traditional hour and minute display of most luxury watches and echoing the more modern digital world of timekeeping. 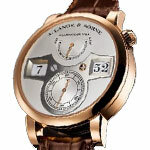 When the creators at Lange began contemplating such a task the question they asked themselves was “Can the principles of a mechanical watch and a modern time indication format be persuasively combined?” With an answer heard around the world Lange introduces Zeitwerk, the first mechanical wristwatch with a jumping numeral display. The A. Lange & Sohne Zeitwerk features a brand new in-house movement L043.1 caliber with a manual wind and a constant force escapement complication. The movement is made up of 388 parts including 66 jewels. This watch is an impressive movement with not one but two jumping complications, one for the hours and one for the minutes. A constant force escapement is situated with the balance wheel to ensure that the same amount of force is released all the time to produce excellent rate results. The oscillation system has a shock-resistant glucydur balance with eccentric poising weights; superior-quality balance spring manufactured in-house with patent-pending attachment system (balance spring clamp), frequency 18,000 semi-oscillations per hour, precision beat adjustment system with lateral setscrew and whiplash spring. The Zeitwerk has a large case which is just under 42 mm wide case but remains only 12.6 mm thick. It is available in four different metals - 18 carat white, yellow, and rose gold as well as platinum. The reason I most admire this watch is the unique dial layout and functionality. Imitating a digital watch with its display of the instantly changing jumping hours and minutes. But keeping the watch from a completely modern style is the small seconds dial at 6 o’clock and the power reserve indicator at the top of the dial. The hands are constructed from rhodiumed gold. The watch is completed by the hand-stitched crocodile strap with a Lange prong buckle in solid gold or platinum. 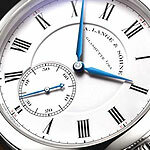 A. Lange & Sohne Richard Lange "Pour le Merite"
The new A. Lange & Sohne Richard Lange "Pour le Merite" is an exquisite example of the company's outstanding horological acheivements. The Pour le Merite timepiece provides the rare combination of a fusee and chain transmission. 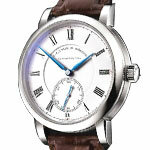 It comes in both platinum and rose gold and features a white dial crafted from genuine enamel with blued steel hands. The beautiful crocodile leather strap is fitted with a Lange tang buckle in platinum or 18 carat rose gold. The watch has a 36 hour power reserve and will be limited to 200 numbered pieces in rose gold and 50 pieces in platinum. 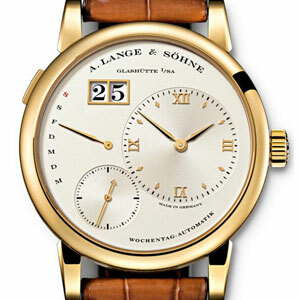 The watch features a Lange L044.1 caliber movement comprises 279 parts. Each component is hand finished. The watch incorporates the fusee and chain energy transmission system that has previously been used in two other highly respected A. Lange & Sohne timepieces. The fusee and chain system is extremely difficult to produce, but the difficulty pays off by solving the declining torque in the winding train. The conical fusee is joined to the barrel by a miniature chain that when transferred from the fusee to the barrel will guarantees constant torque and the resultant amplitude. The exquisitely delicate yet durable chain is comprised of 636 individual parts. With the new A. Lange & Sohne Cabaret Tourbillon comes a groundbreaking development 200 years in the making. The tourbillon was originally invented for improved accuracy but it also created a new problem, it could not be stopped. So while it provided extreme accuracy it could not be set precisely to the second. 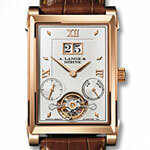 Finally Lange has solved this problem with the invention of the world's first stop seconds mechanism for a tourbillon. The mechanism for this is activated when the crown is pulled. 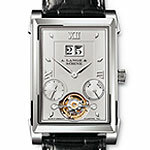 The Cabaret was first introduced by Lange in 1997, and may be best known for its unique rectangular shaped case and oversized date. The Cabaret Tourbillon's case is 29.5 x 39.2 x 10.25mm and is made in platinum or pink gold and has sapphire crystal caseback. The dial is solid silver with rhodiumed gold or pink gold hands and has hours, minutes, small seconds, large date and a power-reserve indicator(up to 120 hours) as well as the one-minute tourbillon with patented stop seconds. The movement is a calibre L042.1 which consists of 373 parts, 84 of which are the tourbillon. The watch is on a crocodile strap with Lange deployant buckle in solid platinum or pink gold.